Today is the 71st anniversary of the Japanese attacks on Pearl Harbor, and the date is on my mind more so than other years since just last month I visited the USS Arizona Memorial. 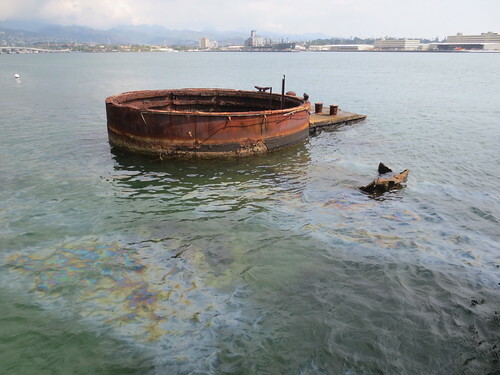 I knew about the oil that still bubbles up out of the wreckage, which is also a grave site, both for men that died there that morning in 1941 and survivors who’ve been interred with their shipmates in the years since. What I didn’t expect was the fish swimming underneath the oil slicks. I guess I thought the chemicals would keep them away, but there they were, brightly colored yellow and white striped bodies glinting under the water as they swam around the rusted metal, vibrant life in a place where there was so much death.